Japan's answer to Walt Disney does not like technology. 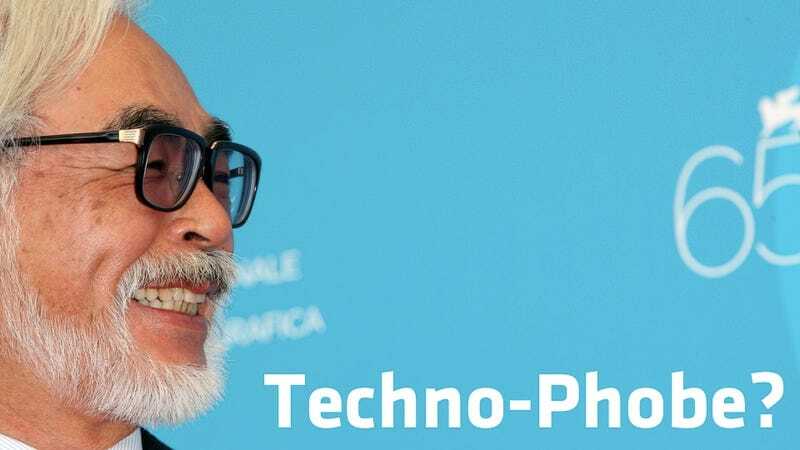 Hayao Miyazaki is concerned that the virtual world of video games, television, and even his own Ghibli Studio animated movies, is snatching away power from kids. Better teach them how to use knives! "The environment that surrounds our children, including our animation, is all virtual," says Miyazaki, known for films like My Neighbor Totoro. "TV, video games, and then email, cell phones, manga. In short, I think the work that we are doing is snatching away children's power." This power he is referring to seems to be children's natural sense of wonder and creativity. Miyazaki points out the inconsistencies of this, as he makes animated films. "As we are making movies, we always ask ourselves what we are going to do about it. "There are things date back from the Stone Age that kids must learn before kids start learning to read and write," he continues. Like? According to Miyazaki, those are how to make a fire, how to keep it burning and put it out, how to climb a tree, how to tie a rope, how to use a needle and thread and how to use a knife. "Before children learn to read and write," Miyazaki adds, "I think the country has a duty to teach children these things." Obviously, the animator wants children to learn and experience the tactile world around them. Once Miyazaki was asked if he uses the internet, and he replied that he does not. "I don't have a computer or fax," he said. "I don't have a DVD player either and I forgot how to use a video recorder. I even seldom watch television." He added that he once played a Japanese chess game with a computer and lost, noting that the computer was "not fair". But, Does Hayao Miyazaki Play Video Games?! Last summer, Miyazaki called the iPad a "game machine-type thing" that people are "stroking with strange gestures". Continuing, he said the iPad was "disgusting" and added, "On trains, the number of those people doing that strange masturbation-like gesture is multiplying." Hayao Miyazaki is the greatest animator alive. And he does not like the iPad. Most recently, Miyazaki's Studio Ghibli collaborated with Fukuoka-based game company Level-5 on role-playing game Ni no Kuni for the Nintendo DS. A PS3 version is expected to be released this year in Japan.